Cleidocranial dysplasia can be diagnosed by clinical and radiological examination of the face, cranium, and clavicles. Radiological findings of CCD are pathognomic, that is, broad sutures, large fontanels persisting into adulthood, numerous wormian bones and numerous unerupted, and supernumerary teeth. The aim of this paper is to report clinical and radiological findings in seven cases of CCD. Facial features-frontal and parietal bossing, hypertelorism, broad nasal bridge, underdeveloped maxilla and zygomatic bone, mandibular prognathism. Intraoral findings-retained primary teeth, missing permanent teeth, malocclusion, supernumerary teeth, any cleft of the palate. Shoulder hypermobility-patient was asked to approximate shoulders in front of the chest. Impacted permanent teeth, supernumerary teeth and follicular cyst if any. Clinical findings for all cases are tabulated in [Table 1]. The age of the patients ranged from 13 to 55 years with a mean age of years. Of seven cases, 2 were female, and 5 were male with a male to female ratio of 2.5:1. All patients reported with the chief complaint of retained primary teeth and missing permanent teeth. Depressed malar process and relative mandibular prognathism were seen in all the cases [Figure 1]. 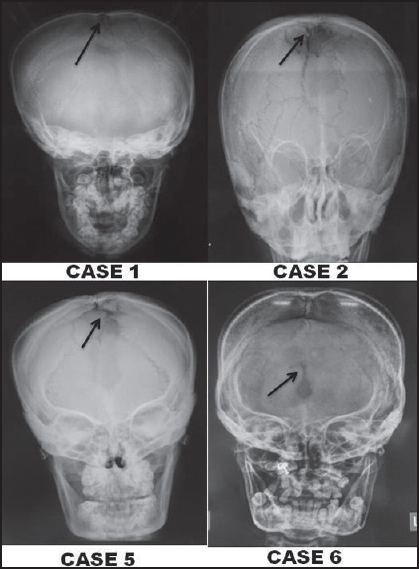 All patients had broad and short skull, but with the exception of case 3, frontal and parietal bossing was seen in all the cases. Except for case 4, hypertelorism, and depressed nasal bridge was also seen in all the cases. Toe abnormalities were present only in one case, which showed short fourth and fifth digit [Figure 2]. Shoulder hypermobility was complete in case 5 and 7 [Figure 3], partial in case 1, 2, 3 and 4 [Figure 4], whereas no mobility was seen in case 6. 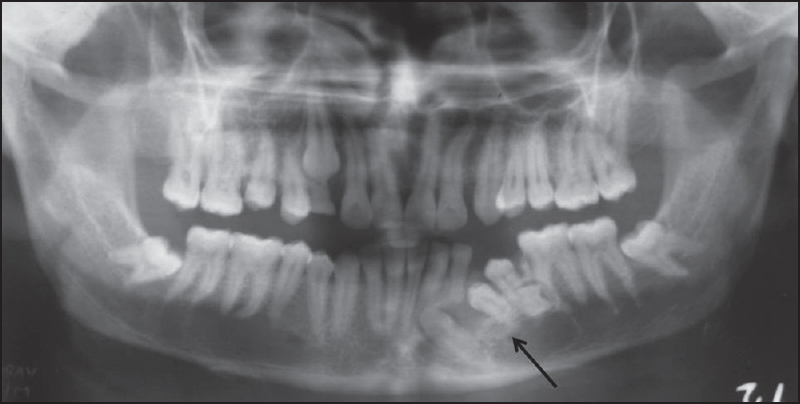 With the exception of case 6, retained primary teeth were seen clinically in all cases with number of teeth ranging from 2 to 12 [Figure 5]. None of the cases had full complement of erupted permanent teeth with number of erupted permanent teeth ranging from 8 to 25. In almost all cases, erupted permanent teeth included maxillary and mandibular central incisors, first and second molar. Retained primary teeth included maxillary and mandibular canine, first and second molar. Radiographic findings of all cases are presented in [Table 2]. On PA and lateral skull view, open skull sutures and wide, open fontanels were seen in all cases [Figure 6] except for case 3. 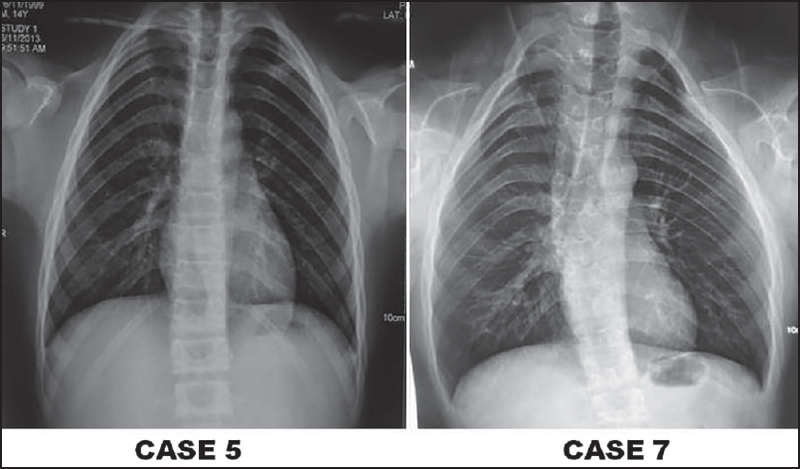 On radiograph of chest, clavicle was present on both sides in case 6, whereas complete clavicular aplasia was seen in case 5 and 7 [Figure 7] and hypoplasia of clavicle was seen in case 1, 2, 3 and 4 [Figure 8]. On orthopantomograph, retained primary teeth, unerputed and impacted permanent teeth and supernumerary teeth were seen. Total number of teeth present ranged from 22 to 46. 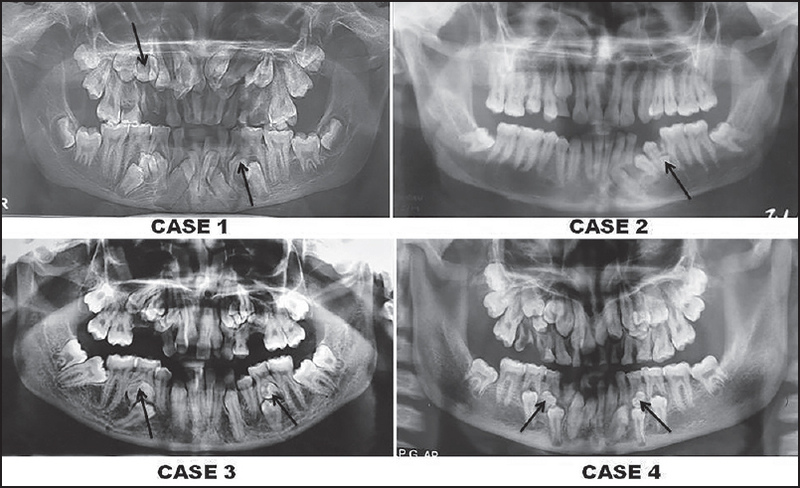 With the exception of case 5 and 6, impacted supernumerary teeth were seen in all cases, and the number ranged from 1 to 4. Most of the supernumerary teeth had a resemblance to premolar teeth [Figure 9]. There was evidence of a follicular cyst seen in relation to impacted left mandibular canine, first and second premolar in case 2 [Figure 10]. In most of the cases, unerupted and impacted permanent teeth included maxillary and mandibular canine, first and second premolar and third molar. Cleidocranial dysplasia primarily affects the bones, which undergo intramembranous ossification, especially skull, clavicles and flat bones, hence termed cleidocranial. The clavicle is the first bone to ossify and exhibits many deformities ranging from varied degrees of hypoplasia to complete absence of clavicles. Complete absence of clavicles, seen in 10% cases results in hypermobility and drooping of shoulders. 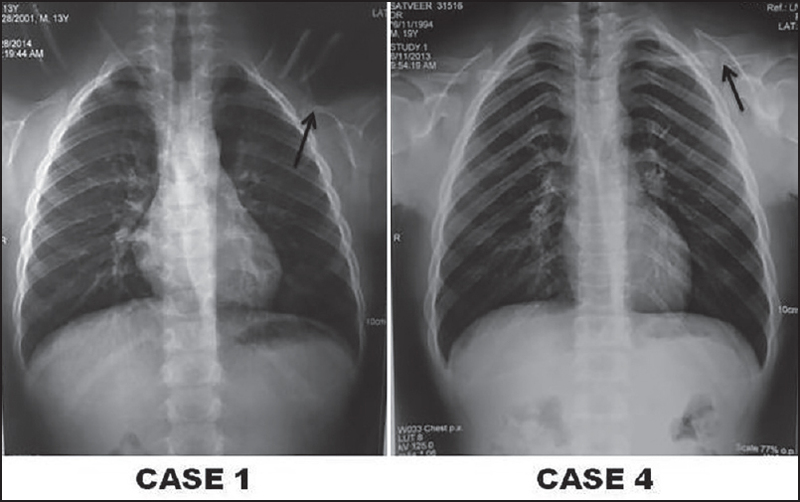 ,, Chest X-ray in our cases showed hypoplasia of clavicle in four cases, and complete absence was seen in two cases with shoulder hypermobility. Lack of cellular cementum or. Lack of union between dental follicle and mucosa due to interposed fibrous tissue which acts as a barrier to eruption. Other findings include short stature, bell-shaped thorax, hypertelorism, hypoplasia of pelvis, frontal and parietal bossing, and phalangeal abnormalities. Shortened or absent nasal bones, paranasal sinus abnormalities, small maxilla and delayed union of mandibular symphysis are less common findings of CCD. Nearly all our cases showed frontal and parietal bossing, hypertelorism, broad nasal bridge whereas phalangeal abnormalities were seen in only one case. A radiograph is the most important means by which diagnosis of CCD can be confirmed. , Chest radiograph of the patient shows hypoplastic or aplastic clavicles. Radiograph of the skull is pathognomic of the disease. Skull shows diffuse areas of rarefaction with most ossification in the frontal bones. Cranial sutures are broad, and fontanels are large and persist into adulthood. Individual bones of the head show evidence of accessory centers of ossification, which gives the appearance of large number of wormian bones. , All these findings were present in skull radiographs of our patients. Diagnosis of CCD is based mainly on clinical and radiographic findings. Well-functioning permanent dentition and esthetic facial appearance can be achieved with multidisciplinary approach if diagnosed well in time during early stages of childhood development. Mehta DN, Vachhani RV, Patel MB. Cleidocranial dysplasia: A report of two cases. J Indian Soc Pedod Prev Dent 2011;29:251-4. Qiam F. Cleidocranial dysplasia-literature review & an evidence based clinical report. J Khyber Coll Dent 2010;1:48-51. Garg RK, Agrawal P. Clinical spectrum of cleidocranial dysplasia: A case report. Cases J 2008;1:377. Han JW. Cleidocranial dysplasia: A case report. Korean J Oral Maxillofac Radiol 2005;35:225-9. Singh S, Sharma S, Singh H, Wazir ND. Cleidocranial dysplasia: A case report illustrating diagnostic clinical and radiological findings. J Clin Diagn Res 2014;8:ZD19-20. Currall V, Clancy R, Diamond D. Cleidocranial dysplasia. Curr Orthop 2007;21:159-62. 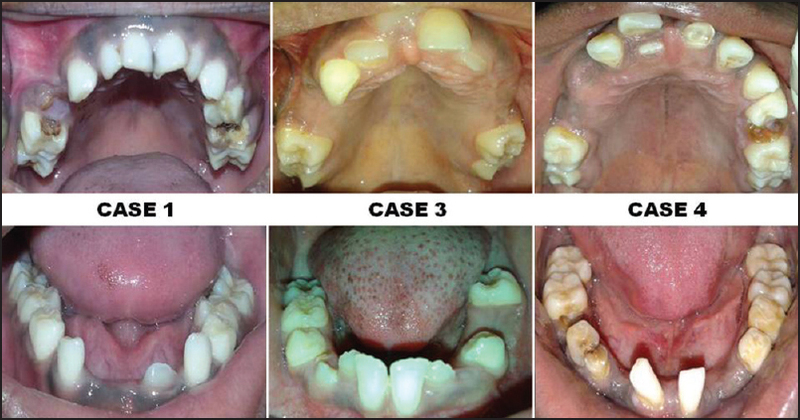 Alves N, de Caso R. Cleidocranial dysplasia - A case report. Int J Morphol 2008;26:1065-8. González López BS, Ortiz Solalinde C, Kubodera Ito T, Lara Carrillo E, Ortiz Solalinde E. Cleido cranial dysplasia: Report of a family. J Oral Sci 2004;46:259-66. 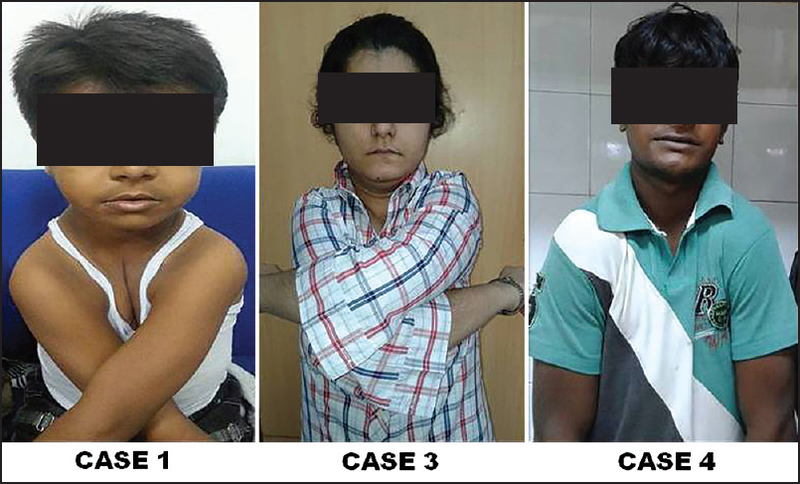 Hemalatha R, Balasubramaniam MR. Cleidocranial dysplasia: A case report. J Indian Soc Pedod Prev Dent 2008;26:40-3. Yamamoto H, Sakae T, Davies JE. Cleidocranial dysplasia: A light microscope, electron microscope, and crystallographic study. Oral Surg Oral Med Oral Pathol 1989;68:195-200. Koch PE, Hammer WB. Cleidocranial dysostosis: Review of the literature and report of case. J Oral Surg 1978;36:39-42. Gombra V, Jayachandran S. Cleidocranial dysplasia: Report of 4 cases & review. J Indian Acad Oral Med Radiol 2008;20:23-7. Daskalogiannakis J, Piedade L, Lindholm TC, Sándor GK, Carmichael RP. Cleidocranial dysplasia: 2 generations of management. J Can Dent Assoc 2006;72:337-42.